Book review by Kim H.
I have a few books in my 'book stash' that I really love. One of them is Pillow Pop. 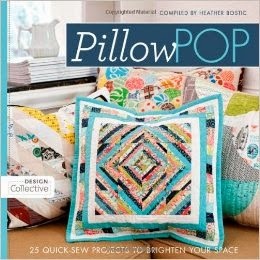 This book has been compiled by modern sewist and blogger Heather Bostic and includes lots of different contributors. The photos are inspiring and the directions are clear and simple. There's no such thing as too many pillows. And if you're going to have pillows, they might as well look like mini quilts – right? A lot of the pillow projects in this book finish nice and big, a lot of them are 20 inches. They include different techniques from simple piecing to a little more challenging, like curved piecing and Cathedral windows. My one complaint about this book is that the templates for some of the patterns need to be enlarged. If you get this book, check online for corrections. I think there is only one. Thanks for the great book review Kim! Great review Kim - I am a lucky recipient of one of theses pillows! The colors are great and the velveteen, perfect! When a large amount of quilters I know start and quilt and it ends up as a pillow!